U.S. Customs and Border Protection (CBP) officers in what is frequently reported as the “safe border city” of El Paso, Texas, busted a woman attempting to enter the United States from Mexico with about $1.6 million worth of methamphetamine. The woman, a U.S. citizen from Dallas, was crossing into the U.S. from Mexico at the Paso Del Norte international crossing when her 2003 Chevy Trailblazer was selected for secondary inspection. At the secondary checkpoint, “Tiran,” a CBP trained drug sniffing K9 alerted to narcotic in the rear area of the vehicle. 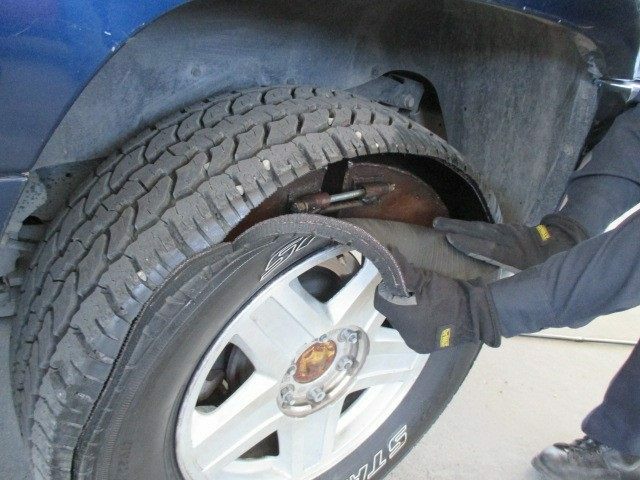 Officers then scanned the Trailblazer with their Z-Portal x-ray system and found anomalies in the rear tires. Officer cut into the tires and discovered metal collars bolted to the rims of the wheels. After cutting open the collars, officers discovered a dozen bundles of meth. The estimated street value of the load is reported to be $1,625,600. The CBP officers arrested Matilda Perez of Dallas, Texas. She was turned over to U.S. Immigration and Customs Enforcement HIS special agents and is expected to face charges of drug smuggling. While the CBP report does not say who she was attempting to smuggle the drugs for, Breitbart Texas’ Ildefonso Ortiz reported in September 2015 the shipment of drugs in the El Paso area is controlled by the Sinaloa, Beltran Leyva, and Juarez drug cartels. Officials in Texas border cities claim their areas to be “Safe Cities” despite the heavy presence of drug smuggling and human trafficking by hyper-violent transnational criminal organizations. Ortiz reported in July 2015 about the outdated crime reporting systems used by local law enforcement to hid the true level of crime in their areas. Drug trafficking related offenses like human trafficking, extortion, racketeering, and other criminal enterprise activities are often not included in these outdated reports, Ortiz wrote. He said these activities are synonymous with Mexican drug cartel activities. The El Paso Times has written about their city being ranked as the safest large city in the U.S. four years in a row. That ranking comes from CQ Press and uses the outdated UCR crime reporting system. In February, Breitbart Texas reported about an El Paso school teacher being sought by U.S. Marshals for her alleged involvement in cartel related crimes including conspiracy, money laundering, kidnapping and drug trafficking. 42-year-old Monica Velasco quit her job at Manor Elementary in September 2015 after charges were filed against her two sisters and brother involving a 2008 murder in Juarez of a man and his two daughters. All of this in America’s safest city.